Far-future cosmic epic from the veteran author of The Fleet of Stars (1997), etc. Early in the next century, speed-of-light starships become feasible, while astronomers discover that, 5,000 light-years distant, another race is already using starships. So, as various colony vessels depart for nearby stars, an expedition to visit the distant “Yonderfolk” gets under way. After a tedious introduction to the crew’six males and four females encompassing the necessary specialties and their various sexual pairings’starship Envoy departs on a round trip wherein 10,000 years will pass on Earth, while the voyagers age only a few years. As they approach the Yonderfolk’s location, however, their starship traces dwindle, and the crew debates whether to continue or return to Earth. Meanwhile, as time passes nearer home, the “Kithfolk” of the starfarers become more and more isolated from ordinary society (many of these interludes are stories in their own right). Finally, Envoy encounters the centaur-like Tahir, a race that, having abandoned starfaring, achieved an advanced, stable culture. Humans and Tahir evolve a common language and decide to visit a nearby black hole where an extraordinary intelligence, called the Holont, has been detected. 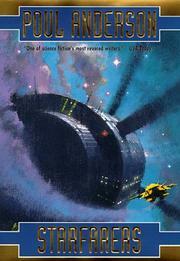 Rejecting the prospect of spending more years in space, megalomaniac crewman Al Brent mutinies, two other voyagers die in the struggle to retake the ship from Brent, and while investigating the Holont, pilot Jean Kilbirnie is killed, though the survivors learn a method to send messages through time. Finally, Envoy returns to Earth, where 11,000 years have passed and their voyage is forgotten. They go back in space, then, to join the colony worlds, where the starfaring urge has not yet been extinguished. An episodic, disconcerting mix of mind-boggling ideas, thrilling storytelling, dull padding, and characters-by-numbers, set forth in Anderson’s patented outlandish, antique prose: probably his best-ever full-length outing.